One might say that Father Tony Massad was destined to become a priest of the Maronite Church. Well, perhaps not destined to, but he certainly was directed through his childhood experiences that centered around his local Maronite church, Our Lady of Lebanon in Flint, Michigan. Our Lady of Lebanon Seminary, Washington, D.C.
Born in 1984, in Sidon, Lebanon, to a Lebanese-American mother and a Lebanese father, he spent the first four years of his life in Lebanon and in Oman. The family, which now included his siblings Alicia and Paul, returned to the United States in 1987 where this teddy bear of a man says with a chuckle in his voice, “I had pretty much an American upbringing with an immigrant flair!” He attended the local schools in Flint, hung out with friends, played basketball, and rode bikes. The immigrant flair, however, proved to be the strongest influence in his life. 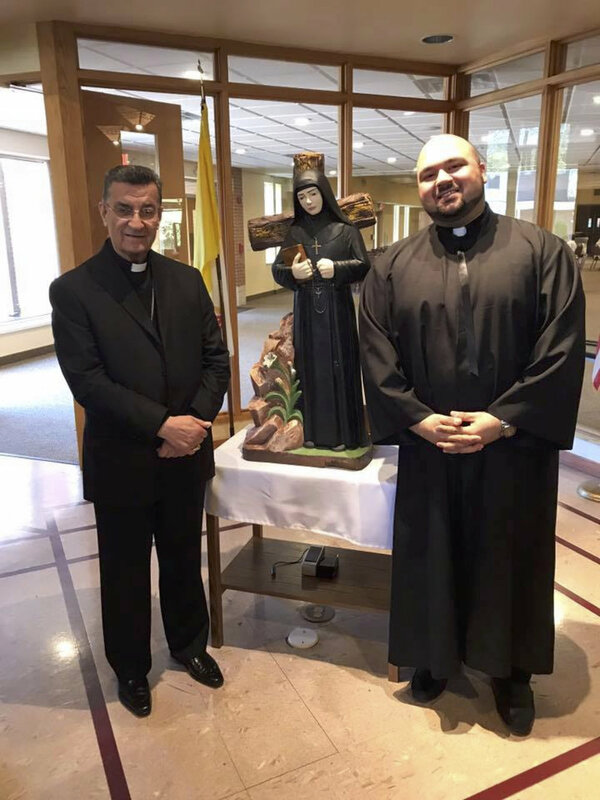 He fondly remembers serving at the altar for 14 years, training others to do the same, and attending Maronite Youth Organization (MYO) retreats where he established lifelong friendships. Fr. Tony credits his pastor, Monsignor Anthony Spinosa, with serving as a good example. He recalls that at about age 16 friends began calling him “Abouna” and he started to think it just might be “cool” to be a priest. However, much like the average American teen, he turned his attention toward attending college as the thought of entering the priesthood proved to be a bit overwhelming. Following his graduation from the University of Michigan in May 2002, Tony began a discernment year and in September 2003, he entered the Maronite Seminary in Washington, D.C. In June 2010, the young man was ordained in his hometown parish with his family and lifelong friends in attendance. He emotionally recalls one of his proudest moments, which was when he and his family travelled to Lebanon in 2011 and he celebrated Mass in his father’s hometown. He is the first Massad from that village to become a priest. In 2013, Father Tony returned to Michigan as pastor of the St. Rafka Mission and in April 2014, the community received designation as a full-fledged parish in the Eparchy of Our Lady of Lebanon. Under his pastoral guidance, St. Rafka Mission has grown from 125 to 225 families. “I not only want to grow the size of the parish from a numbers perspective, but more importantly, I hope to see this congregation become a more faithful people who actively practice and live their faith,” says Massad. In addition to his pastoral responsibilities at St. Rafka, Father Tony serves as Director of the Maronite Young Adults (MYA) for the Eparchy of OLOL. “Working with the young adults in my capacity is a very meaningful and deeply personal assignment because I am able to recall my own involvement as a teenager in MYO and MYA—the roots of some of my longest and most meaningful friendships,” says Massad. He hopes that current members are fortunate enough to experience the same. Eparchy of Saint Maron of Brooklyn and Our Lady of Lebanon of Los Angeles.